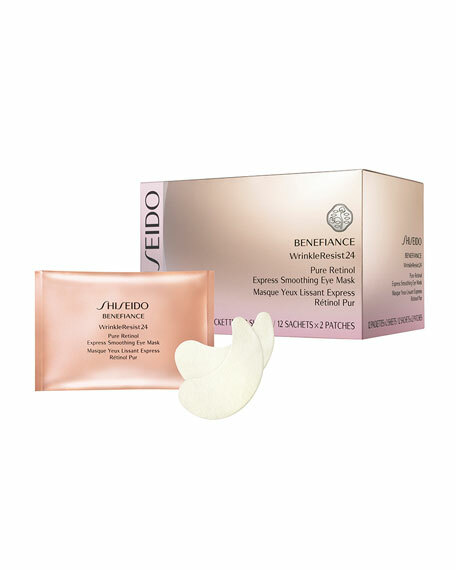 These quick, concentrated Shiseido treatment sheets reduce the appearance of wrinkles with just one 15-minute application. Each use refines the skin's texture and improves its resilience for eyes that look vibrant and skin as smooth as silk. Set of 12 masks. Pure Retinol Micro-Infusion technology penetrates skin instantly to smooth away wrinkles. Includes Benefiance's powerful WrinkleResist technology to prevent new wrinkle formation and treat existing wrinkles. Instantly brightens to counteract dark circles and dullness. Plumps skin with 24-hour hydration. Wrinkle Retouching Fiber Sheet Mask conforms to skin to seal in essence and refine texture.